What Makes Sense For Your Business? Google Ads and Facebook Ads have been longtime competitors in the digital marketing landscape, but what exactly sets them apart from each other? Works primarily based off of paid search results. Has the widest audience and reach of any digital advertising platform, producing 1.2 trillion web searches every single year! Offers a level playing field, rewarding advertisers with relevant and high-quality ads, rather than just those with the biggest budgets. Works primarily based on paid display advertisements. Audience granularity allows for campaigns to be hyper-focused based on specific demographics, interests, beliefs, conversations, and values. Facebook’s news feed inconspicuously integrates visual and display advertisements. 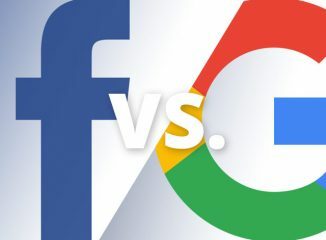 Given this information, it is easy to conclude that Google Ads and Facebook Ads actually work best in concert with each other, as opposed to the popular belief that they are competitors. When coupled together, Google Ads and Facebook Ads provide an impeccable way to generate brand awareness, new business leads, and ultimately, a high conversion rate with a low customer acquisition cost.